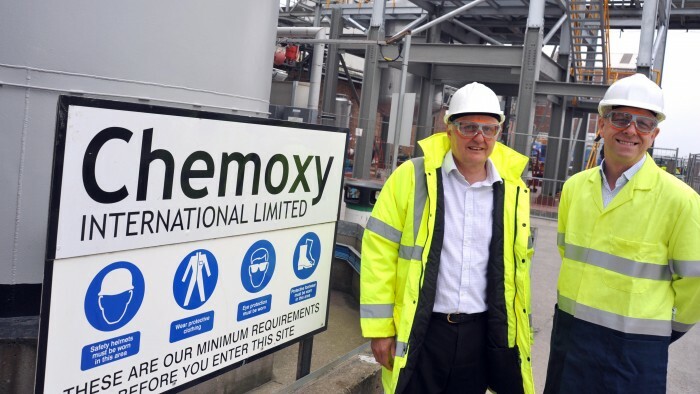 One of the Tees Valley’s fastest-growing chemical companies, Chemoxy International Ltd, is set to double the size of its Billingham plant.The move is part of a £6m expansion project being carried out by Chemoxy with support from the Regional Growth Fund. Ian Stark, chief executive officer, said: “We are seeing increased demand for our manufacturing services and our environmentally-friendly, solvents and our new plant will significantly increase our capacity. “We pride ourselves on having the agility and responsiveness of a small company partnered with the quality and level of service of a much larger organisation. Chemoxy is a leading provider of manufacturing services a variety of science based industries including petrochemicals, oil and gas, flavour and fragrances, and agricultural chemicals. The company also produces its own range of low toxicity solvents which are sold to paint companies all over the world. Chemoxy is also one of the UK’s leading solvent recyclers which is environmentally beneficial and helps to reduce the UK’s carbon footprint. Commissioning at the newly-acquired site is expected to begin in July. The expansion has resulted in the creation of 15 jobs, including process operators, support staff and those focused on business development – bringing the number of people employed by Chemoxy to 130. The expansion comes just two years after the company was created following a management buyout of Dow Chemical Company’s two Teesside custom processing plants and follows a major expansion in 2012. Dr Stan Higgins of NEPIC said: “The team at Chemoxy must be very proud of their performance since they took ownership of the company. “Yet again we have seen how fine and speciality chemical companies can produce excellent performance when decision making is localised, confirming the need for such companies to be to entrepreneurial, competitive and fleet of foot in these globalised markets. “The are several such success stories for companies in our region who have blossomed when they have dropped the shackles of large corporate organisations through management buyout. “Chemoxy, Fine Organics and Aesica are all fantastic examples of what can be achieved. Chemoxy is a good example of a high growth SME in advanced manufacturing, with highly skilled workforce and large export sales, which is helping to revive the UK economy. Chemoxy is one of Europe’s leading contract manufacturers providing manufacturing services to companies engaged in Speciality Chemicals, Petrochemicals , Oil and Gas, Agrochemicals, Flavour and Fragrance and Household and Personal care sectors. In addition, the company manufactures a range of environmentally friendly solvents, including Coasol™, which is used in the latest generation of paints and cleaning products. The business is divided into three key areas: Custom Processing, Chemoxy Products and Solvent Recovery. The Middlesbrough site has been carrying out distillation since 1868 and the Billingham plant was added to the portfolio in 1994.